HMS Queen Elizabeth is the lead ship of the Queen Elizabeth class of aircraft carriers, the largest warships ever built for the Royal Navy of the United Kingdom and capable of carrying up to 60 aircraft. She is named in honour of the first Queen Elizabeth, a renowned World War I era super-dreadnought, which in turn was named after Queen Elizabeth I. The new Queen Elizabeth will carry her namesake’s honours, as well as her Tudor rose-adorned crest and motto. The ship began sea trials in June 2017 and was commissioned on 7 December 2017. Her first Commanding Officer is Commodore Jerry Kyd, who had previously commanded the carriers HMS Ark Royal and HMS Illustrious. As Captain of HMS Queen Elizabeth, Kyd will wear the Royal Navy rank of Captain while retaining the substantive rank of Commodore. 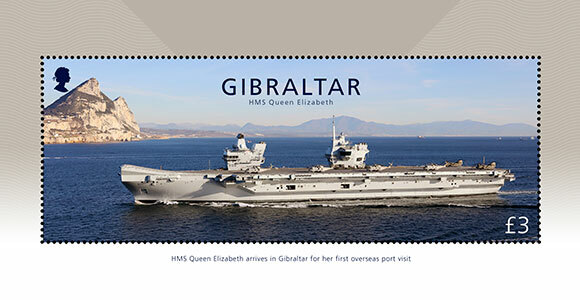 Her first overseas port visit was to Gibraltar on 9 February 2018. On leaving Gibraltar HMS Queen Elizabeth went on to conduct helicopter trials with specially equipped Merlin and Chinook aircraft from the Aircraft Test and Evaluation Centre at MOD Boscombe Down.